Frank Herbert’s seminal 1965 science fiction novel Dune is one of the most influential works of the genre, and indeed of American popular culture, of the century past. But it only barely feels like it. Herbert’s involved world-creation, synthesis of older global mythologies and narrative tropes, and invocation of political currents and ideas contemporary and historical in Dune not only set the standard for popular literary sci-fi but was a major formative influence (or a source of shamelessly pillaged material for it, depending on your point of view) on George Lucas’ Star Wars, the true colossus of American pop culture of the past half-century. Dune, in comparison to its marketplace-astriding genre progeny at least, has come to feel like a boutique piece of niche interest and dated importance. This is almost certainly because it has proven stubbornly difficult to bring to the screen and has therefore not stepped far beyond its page-bound generic detention cell. A pair of high-rated and award- winning Syfy television miniseries around the turn of the millennium are generally agreed to be the best filmed adaptations of Herbet’s Dune series, but they remain in this genre jail by their very nature (perhaps today, in a cultural landscape where serialized television is challenging film’s cultural primacy, they might have slipped through the bars). Until we see what Quebeçois impresario Denis Villeneuve has in mind for the material in his forthcoming (likely two-film) version of the initial Dune novel, the best that the big screen can do for Herbert’s classic is David Lynch’s notoriously compromised 1984 release. This film rose from the ashes of Alejandro Jodorowsky’s astoundingly ambitious mad-scientist vision for Dune, which collapsed without funding in the mid-1970s but directly transformed into Ridley Scott’s Alien shortly thereafter. Emblazoned with the imposing imprimatur of Hollywood mega-producer Dino De Laurentiis and the sharply contrasting directorial credit of the extremely idiosyncratic David Lynch, this Dune was not necessarily doomed from conception, but a mélange of creative choices, production and editorial interference, and technological limitations does it in fatally. Set some eighty centuries in the future, Dune tells the epic tale of a galactic rivalry of powerful aristocratic houses over the most valuable commodity in the universe, a mysterious resource known as spice. Spice can be refined into a powerful narcotic-like substance which extends life, expands consciousness, and allows interplanetary travel, but it can only be mined on the desert planet of Arrakis (a.k.a. Dune). Long the domain of the sinister House Harkonnen and its corpulent, depraved, sore-encrusted Baron Harkonnen (Kenneth McMillan), Arrakis is handed over to the honourable, martially-minded House Atreides and its leader Duke Leto (Jürgen Prochnow) as part of a complex double-cross by the universe’s Padishah Emperor Shaddam IV (José Ferrer), who seeks to eliminate the Atreides generally by allowing the Harkonnens to arrange a devastating ambush but whose true target is the Duke’s son and heir, Paul (Kyle MacLachlan). The Emperor has been warned by a spice-imbibing Spacing Guild Navigator (deformed by years of spice exposure, this one is visualized as a floating brain-slug with a mouth disturbingly like a vaginal opening) that Paul Atreides might have messianic powers and could prove a greater threat to the old man’s rule than even his popular father the Duke. The dominoes begin to fall even before House Atreides is established on Arrakis, and soon (but maybe not soon enough, given the film’s top-heavy pacing) Paul is on the run from the Harkonnens on the sand dunes, which are infested with enormous worms the size of ocean liners and inhabited by obscure spice-connected people known as the Fremen with their own plans for Dune and for the future of spice extraction. Considering the obvious truncation in editing boiling down to two hours a film that would be far better at nearer to three, Lynch (working from his own script) does an admirable job in the info-heavy expository first act. It can be a bit stiff as info-dumps in this genre have a habit of being, but the world-building effort is aided immensely by the fanciful production design and detailed costumes (the film was shot in Mexico City of all places, using 80 sets, and the expense and effort shows). The key matter is that the players, stakes, and forces at play are well-established when the Harkonnen net falls on the Atreides. Unfortunately, it’s in the last hour or so that Dune runs off the rails. This is partly due to the action-heavy later acts falling victim to greater editing compression and partly due to its reliance on special effects that, despite being the absolute state of the art in the early 1980s, fall woefully short of convincingly depicting the epic scale of the narrative events. Observers objecting to the age of CGI ought to be asked to account for why they feel dodgy combos of optical and practical effects like this are better. Lynch’s odd choice to make characters’ inner thoughts audible hardly helps; a common narrative practice in genre fiction, it is employed on film with little thought to how jarring it can be (especially when applied across the board, in major and minor characters alike, to emphasize key points but also tangential and quickly-forgotten observations and emotions). Lynch makes some such errors, certainly, and he doesn’t get the support he needs from the effects or the requirements of the editorial overseers or indeed from his cast (MacLachlan became a legendary Lynch favourite but he’s adrift here, while recognizable faces from Ferrer and Prochnow to Max von Sydow, Patrick Stewart, Brad Dourif, Sean Young, and even Sting drop in and out as needed). But it has to be said that Herbert’s themes, some of them feeling rather dated, do him no favours either. Neither the spice-related elements of drug addiction nor environmental and societal implications of imperialist resource-exploitation get much play from Lynch’s plot-focused script, and the rampant white-saviour tropes of Paul Atreides becoming a messianic leader to the indigenous insurrectionary Fremen are taken at absolute face value (and largely neutralized by the Fremen being cast entirely as white folks as well). Of course, even Herbert could not have anticipated that some of the then-obscure Persian, Arabic, Islamic, and Kabbalistic Jewish terms that he pillages for his Dune world (namely the Fremen’s belief in a holy war, or jihad) would take on wider cultural prominence and newer and more sinister meanings decades later. Lynch, never an artist with a particularly keen focus on the nuances and contradictions of politics and history, does not strain to process the implications of Herbert’s ideas. Lynch is a visualist who encodes his meanings in images and prefers his words to be gnomically poetic or defamiliarizingly comedic (which is why Twin Peaks remains his defining work, being grounded in both of these poles). Dune is source material that greatly rewards the former but requires greater skills of writing synthesis than the latter displays. It is also, it must be said, not ambiguous in terms of intellectual intention or moral justice. Lynch is less interested in Dune‘s mythologically-derived moral playgrounds, and immerses himself instead in its imaginative realms. 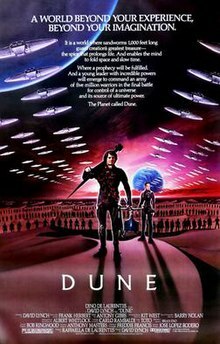 Dune, it seems, requires more than David Lynch can bring to it, or could bring to under constrained circumstances in the early 1980s at least, to be successful. Perhaps this is more of a statement to its core potency than box-office returns or large-scale cultural penetration can provide.